How is it possible to get the best ROI of your digital signage installations? Singapore is a paradise for travellers. This is not because of its superior architecture and advanced lifestyle. But the attractiveness of the place is noticeable more because of the unique blend of nature and man-made structures. Besides being a heaven for tourists, Singapore also has one quality that upsets a lot of people and that is its expensiveness. If you are not careful, it’s easy to spend thousands of dollars without any valid reason. As a savvy traveller, you wouldn’t want that to happen. You are here to enjoy and savour the environment and relish everything that this island city is about to offer you with open arms. So it’s indeed important to plan well ahead of time, maybe even before purchasing your airplane tickets. Food options in Singapore can be tricky. It can cost you a fortune but also you can get cheap options you know where to look for it. One of the best ways to cut down your food costs is to have brunch. Why most travellers prefer having brunch is because it takes up the time between breakfast and lunch. Additionally, a well-prepared brunch can keep your stomach filled for a long time, allowing you to sustain a longer period without craving for more. But where do you get hold of some of the exquisite brunch options in Singapore? 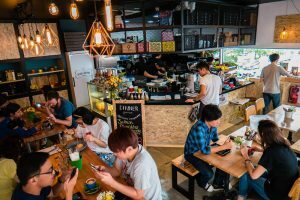 Of course, Bukit Timah is the place to be if you are willing to have some of the best food options in the town. But there are too many options, which can make things difficult for a first timer. That’s why we have prepared a list of some of the best brunch in Bukit Timah. Whether you are travelling with your family or spouse, the ‘Rider’s Café’ is the best place to have a heart-melting brunch. Their French toasts have been the talk of the town right from the day of the café’s inception. The toasts are best tried with caramelized bananas along with bacon. Although you won’t be troubled too much to secure a seat during weekdays, we recommend that you book in advance for weekends as the place experiences too much crowd. Do you love egg benedicts? If the answer is yes, you shouldn’t miss visiting this amazing brunch destination. Here, you’ll probably get the best poached eggs in the town. Besides, the price for each brunch menu is way cheaper than many other similar restaurants. To avoid the crowd, make sure to show up before 10 am. If you are looking for the ultimate brunch option in Bukit Timah, Atlas Coffeehouse is the place to be. The signature dish served here is a huge slice of sourdough bread with toppings of mushroom on it. The bread is best served with white wine cream sauce along with parmesan cheese. We can bet you’re feeling water droplets in your mouth just by reading about the dish. Just imagine how much you’re going to enjoy at the location.